Freida Pinto, one of the stars of Slumdog Millionaire, is now in her next major big-screen appearance where she is the lead female role in the ground breaking film ‘Miral’. Directed by Academy Award Nominated director Julian Schnabel and distributed by Hollywood mogul and cochairman of the Wesinstein Company, Harvey Weinstein. Pinto will be seen working alongside some of Hollywood's most respected actors including Academy Award Winning actress Vanessa Redgrave (Mission Impossible, Blow Up) and two-time Academy Award Nominee Willem Defoe (Spiderman). The film's story puts Pinto into the challenging role of Miral, based on the autobiographical novel of the same title by Palestinian journalist Rula Jebreal. ‘Miral’ illustrates the plight of a young orphaned Palestinian girl growing up in East Jerusalem who is confronted by the effects of the occupation and the Arab-Israeli war in every corner of her life. Miral goes beyond the complex politics of the Israeli-Palestinian conflict and provides an in-depth and emotional portrait of the women who must not only survive it - but who will end up defining it. ‘Miral’, while a deeply personal story, is an eloquent call for equality between Palestinians and Israelis. The artistic collaboration between a Palestinian writer (Rula Jebreal) and a Jewish-American Filmmaker/Artist (Julian Schnabel) embodies the film’s message of peace. “I’m hoping that this film could in its own small way, begin a much needed national (US) conversation about this highly controversial issue,” declared Schnabel at the UN General Assembly screening. It seems that America’s most famous living painter and filmmaker is well on the way to do just that. As with Julian Schnabel’s previous films, ‘Miral’ is a touching and provocative film sure to leave audiences talking. Miral opens on March 25, 2011. 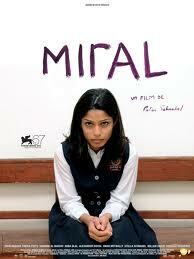 Be sure to watch Freida Pinto as Miral!